HDCN-- Nordic Nephrology Days, University of Lund. May, 1997. Nils Alwall Lecture. Urea Kinetics in Hemodialysis. Practical Implications of the Regional Blood Flow Model. Dr. John T. Daugirdas. Part One of Two. Dr. Daugirdas is Professor of Medicine at the University of Illinois at Chicago. 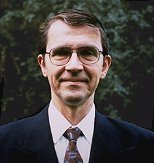 He is the author of numerous papers on hemodialysis hypotension and hemodynamics, urea modeling, and dialysis adequacy, and is an editor of the "Handbook of Dialysis". Good morning. We have come to one of the highlights of this meeting, and it is a great pleasure for me to present our Alwall Lecture this year, on the 50th anniversary of the first dialysis in Lund. The Alwall Lecturer this year is Dr. John Daugirdas, who is known to everyone of you because of his eminent book, The Handbook of Dialysis , and through his numerous and outstanding contributions to the understanding of urea kinetics and dialysis kinetics. John is Professor of Medicine at the University of Illinois, Chicago. So I will please call upon Professor Daugirdas. The title of his lecture is Urea Kinetics During Hemodialysis: Practical Implications of the Regional Blood Flow Model. It is a great honor as a nephrologist to be invited to the Nordic Nephrology meetings. But in particular, as a nephrologist who has made his career in the field of dialysis, it is a great honor to be here in tribute to Dr. Alwall, where dialysis got started, and to be talking in a place several hundred meters from the wing where many of the key discoveries in dialysis were made. This is a thrilling and unforgettable experience for me. Urea Kinetics: Why can't we understand it? Now the lecture today is on urea kinetics. There is a movie in the United States called "Liar, Liar", where a crooked attorney, who is always lying to his son, is forced to tell the truth because his son makes a birthday wish that for 24 hours he has to tell the truth. He develops all types of problems, of course, because he absolutely cannot lie. I think if you don't lie, I think a lot of us deep down don't understand urea kinetics. Somehow the ideas can't be that difficult. We know we are fairly smart--we're nephrologists. But deep down, somehow, there is something missing. And I think this is part of the reason. The reason is, actually, (to tell you a secret) because it's in Babylonian. That's the language urea kinetics is in -- it's in the language of differential equations and matrices. I don't know how Swedish nephrologists are trained, but in the United States most people who follow the medical path only take mathematics up to a certain level of calculus. They don't go into the area of differential equations. Most of the work done and unfortunately some of the things written (pertaining to urea kinetics) are in differential equations. So when we see this, we don't know if this is the equation of the regional blood flow model or if this proves existence of black holes or what? My goal has been to try and explain urea kinetics using simple methods but at the same time using a sophisticated method so that we don't oversimplify and to make it still clinically practical. Now we know that urea kinetics is based on urea, with a molecular of weight of 60 daltons. It's a small molecule. We know urea is only slightly toxic. We know that there is urea generation, and that urea generation is in proportion to protein break down, or the protein catabolic rate. In stable patients the protein catabolic rate is proportional to dietary protein intake. We know that these quantities can be calculated. There are several things that we can measure with regard to urea. We know that the predialysis blood urea/nitrogen level and the time-averaged blood urea/nitrogen level (TAC) are things we can measure. And I think the early modelers were interested in urea plasma levels. The idea was it was bad if the levels were high, but recent evidence suggests that it is also bad if the levels are low because many of these patients are sick and the reason their urea/nitrogen level is low is because they are not eating -- they have poor protein ingestion and aren't generating urea. We know that the problem with the plasma urea level is, that it reflects a balance of removal and production. More recent evidence suggests that it is not good to follow adequacy of dialysis by looking at your patient's BUN level. Your patient can have a BUN of 40 mg/dl and be very sick and be very underdialyzed. The thinking more has changed to indices of urea removal -- the urea reduction ratio (URR) or this quantity called the Kt/V, which reflects removal of urea but reflects the removal of other toxins which are probably more important, although they have not always been identified. This is the primary measure of dialysis adequacy that we use, realizing that we're only talking about small molecule removal; we're not talking about removal of large molecules, such as beta2 microglobulin. Also Dr. Ringoir's group has done some very interesting work, and others, and Dr. Bergstrom, of course, with protein bound uremic toxins. We know that the usual dialysis procedures have very little effect on many molecules that are not reflected by this urea reduction ratio or Kt/V. The Kt/V reflects removal. I'll talk about some of these studies that suggest what the Kt/V should be and the urea reduction ratio. What is the Kt/V? We know that first of all, K is a bad term. K is a term for mathematical constant. Nephrologists are used to thinking in terms of clearance. K is simply the clearance of the dialyzer (and should be called C!). T is time. V is the distribution volume of urea. So if we look at K x t, we have liters/hr x hr. K x t is a volume; and it's in liters. The patient's urea distribution volume (V), about 50 to 60 percent of body weight, is also in liters. So if you divide liters by liters, you get a dimensionless ratio, and you get your quantity Kt/V. To understand how the Kt/V and urea reduction ratio are related, I would like to consider this simple cartoon where the patient now has been reduced to a barrel of 40 liters... Let's say it is a 70 kilo patient, so the urea distribution volume, which is close to total body water, is 40 liters. Assume that the blood urea nitrogen (level) is 80 mg/dl. I'm sorry--this is an American slide. We need to translate this into millimoles. Now we are going through an ideal dialyzer such that fluid which is coming out of the dialyzer has a BUN concentration of zero. All of this has been cleared through the dialyzer and has no urea in it. So, now, the clearance of the dialyzer is equal to the flow through the dialyzer. And what is coming out here, the volume of this fluid that has been cleared (in the collection bucket), is equivalent to K x t. So say the flow rate (K) through the dialyzer is 10 liters per hour -- in four hours all of this fluid will have been passed through the dialyzer. Your end dialysis BUN would be zero. Okay. That's clear? It's just a perfectly simple system. So when we have a Kt/V of 1.0, in other words when we start with a volume of 40 liters, and assuming our K or clearance is 10 liters/hr and we run it for 4.0 hr, we've run the whole volume through the dialyzer, and we've accomplished a perfect dialysis. Our urea reduction ratio is 100 percent. We've removed all of the urea from the body. So in this simple model, a perfect dialysis would be a Kt/V of 1.0. You can't get any better. You've completely cleaned the body. This just shows what happens if you remove half of the volume. At half of the volume, you have 20 liters left here with a BUN of 80 mg/dL. You've passed through 20 liters here with a BUN of 0 mg/dL; and if you mix them together (at the end of dialysis), your final BUN is 40 mg/dL, because you mixed 20 liters with 0 mg/dL and 20 liters with 80 mg/dL, so your final post-dialysis BUN is 40 mg/dL. So the urea reduction ratio (URR) is 0.50. 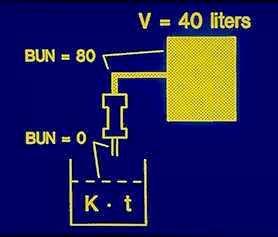 And your Kt/V is also 0.50, because your K x t now -- say your flow is 10 liters per hour for 2.0 hours, you've passed 20 liters through, so 20 (K x t) divided by 40 (V), which is your K x t, divided by your original V, is 0.50. So, you see, in a simple system like this, your Kt/V is simply equal to your urea reduction ratio (URR). We know this is not true, and of course we get Kt/V values that are higher than 1.0 and we still have not removed all of the urea. Why is this? The simple reason is, because (in real life) we cannot disconnect the outflow of the dialyzer tract and take all the clean blood and collect it in a bucket. The blood is going back into the body while it is being cleaned. And this dramatically decreases dialysis efficiency. In the first system, the blood entering the dialyzer has a blood urea/nitrogen concentration of 80 mg/dL constantly during dialysis. Whereas what happens (in the real world) is, this cleaned blood (from the dialyzer outflow tract) dilutes the urea that is here (in the body or bucket), so that the blood entering the dialyzer (during dialysis) now has an entry concentration of 80, 70, or 60 mg/dL (as dialysis progresses). Even though the outlet here has a BUN concentration of 0, even if we take this whole volume and run it through the dialyzer so you have a Kt/V of 1.0, we know just intuitively that we still will have some urea left in the body. In fact, you can take this (entire 40 L volume) and run it through a second time, and you'll still have urea left in the body. You can run it through ten times, and you still will have urea left in the body. This just shows the difference between the two models. On the x axis is the Kt/V. On the y-axis is the urea reduction ratio (URR). The straight line (solid circles) is what happens in a disconnected system. When you reach a Kt/V of 1.0, you have a perfect dialysis and urea reduction is 100 percent. In the recirculating model (open circles) you have an exponential function such that at a Kt/V of 1.0, you have a urea reduction of about 63 percent. Even with two passes (Kt/V = 2.0), we're down to somewhere around 87 percent. But it's still not perfect. The point of this model is, that some people say, "I follow urea reduction (ratio) -- URR." Other people say, "I follow the Kt/V." The two terms are mathematically linked, so they are directly derivable, one from another. The only problem is... and this is a nomogram. This nomogram is simply the same curve as we saw before. It just shows again that, for a Kt/V of 1.0, the urea reduction ratio is 63 percent. The problem comes in because you are removing fluid during dialysis. When you remove fluid by ultrafiltration, you are getting out additional urea from the body that doesn't change the concentration of urea. If you think, for example, of doing isolated ultrafiltration, if you remove 3 liters by isolated ultrafiltration, you remove a certain amount of urea from the body, you've cleared a certain amount of plasma, but the BUN concentration hasn't changed. So in any given patient for any given urea reduction ratio, if you remove more fluid, you'll have a higher level of Kt/V, a slightly higher level of Kt/V. The other issue is, while you're removing fluid (and performing dialysis), somebody is peeing in the pot. At the end of dialysis, the post dialysis BUN is a little bit higher than you expected because there is some urea generation that went on during dialysis. It is these two small corrections (for UF/W and for g) that have necessitated a very complicated solution to this variable volume single pool model that causes a lot of confusion. One has to recognize that the corrections are relatively small and they can be approximated by a simple nomogram, such that you just take the amount of fluid that you're removing, in kilos, and you divide by the patient's body weight (UF/W); and then, based upon whether this (UF/W) is 3 percent, 6 percent, or 9 percent, this actually shifts this curve downward and to the right. Say, for example, we have a urea reduction rate of 65 percent. In somebody with no fluid removal, this would be equivalent to a Kt/V of 1.1. In somebody who is removing 9.0 percent of the body weight (during dialysis), which is quite high, with the same 65 percent urea removal (URR), now the Kt/V increases to 1.4. This is due to the extra urea that is removed due to ultrafiltration. One thing that we have done is we have developed a simple formula for this (Daugirdas JT. Adv Ren Replace Ther 1995; 2:295-304.) . It's in the Handbook of Dialysis and in publications, where you can use a nomogram that will accurately allow you to translate urea reduction ratios (URR) to Kt/V. Why are we interested in this? We are interested in it (URR and Kt/V) because we know that it correlates to outcome. This is original data from the National Cooperative Dialysis Study. This (on the y-axis) is the morbidity index. What they did was ...actually the study was not designed in terms of urea removal; it was designed more in terms of time-averaged BUN, but Dr. Frank Gotch reanalyzed this in terms of Kt/V. If you look at the various subgroups of the National Cooperative Dialysis Study, which was published in the early 80s, you can see that re: Morbidity -- and Kt/V is here on the x-axis -- there seemed to be a break point around a Kt/V of 1.0. So in the groups that got Kt/V's of 0.8 or less, they had a very high morbidity index. In fact, the trial had to be stopped prematurely. Whereas once the Kt/V was greater than 1.0, there seemed to be a much lower morbidity. There was an open question about whether morbidity would continue to decrease as Kt/V increased above 1.0. This is more recent data from the United States Renal Data Systems. This is mortality that has been corrected for a variety of comorbid factors, based upon Kt/V. The data are a little bit jumpy here, but you can see that the Kt/V here was less than 0.9, 0.9 to 1.05, about 1.1, about 1.2, and about 1.3. You can see that there is a general trend to a decrease in (mortality with an increasing) Kt/V. Again above a Kt/V of about 1.2 now, there seems to be no difference (in mortality). There does seem to be a significantly lower mortality at a Kt/V of about 1.2 compared to the reference value of Kt/V of 1.0, actually 1.08. These are the same data by urea reduction ratio (URR), and the curve looks very similar. When we did the analysis to see if Kt/V or urea reduction (URR) was a better predictor of mortality, we found no difference. In other words, you cannot statistically separate the effect of urea reduction or Kt/V based upon mortality, and it doesn't matter which one you follow as an outcomes measure. There are other advantages to following Kt/V, but as an outcomes measure, you may as well follow urea reduction (URR). These are data from Ed Lowrie and Bill Owen. This is based upon Kt/V. They actually did their paper based upon URR. Again, you see mortality dropping... this was actually a larger study--that's why perhaps the data are nicer, but the mortality falls until the Kt/V drops to about 1.2 or 1.3; then the curve seems to become flat. There are other data that I'm not going to show you from the Japanese that suggests that perhaps the mortality continues to decrease at higher levels of Kt/V. These are data from HCFA. This is our government agency that is involved in health services. Everyone in the United States is concerned about mortality (of dialysis patients). They've been trying to decrease mortality. You can see that from 1993 to '94 to '95, there has been a steady, progressive increase in the urea reduction ratio such that in late 1995, the mean or mode or median of the urea reduction delivered in the United States was about 68 percent. And this is about the dialysis that people are giving today. And if you look at our national bodies, what we are recommending, it is that the Kt/V be (at least) 1.2, greater than 1.2, or the urea reduction ratio (URR) be greater than 65 percent. These are equivalent levels of dialysis. Are levels of Kt/V > 1.2 beneficial? We have some further questions about what happens above these levels. This is a controversial area. Everyone is concerned about data from Tassin in France (Charra et al. Kidney Int 1992; 41:1286-1291.) where they give 8 hour sessions three times a week. They have an incredibly low mortality. Their Kt/V levels were about 1.8; urea reductions in the range of 80 percent or more. For this reason, the National Institutes of Health has launched a HEMO study. What we are comparing is a urea reduction ratio (URR) of about 67 percent versus 75 percent or a single pool Kt/V of greater than 1.2 or greater than 1.6. Actually our average levels are turning out to be a little bit higher than this (about 1.30 and 1.65 for single-pool Kt/V). We are also comparing small pore versus large pore membranes. The endpoints of this study will be mortality and hospitalization rates with a number of surrogate endpoints, such as serum albumin, appetite, quality of life, and so on. We won't have any answers from this study for the next three or four years at least. 1. Daugirdas JT. Simplified equations for monitoring Kt/V, PCRn, eKt/V, and ePCRn. Adv Ren Replace Ther 1995; 2:295-304. 2. Daugirdas JT and Ing TS, eds. Handbook of Dialysis. Second Edition. Little Brown & Co. Boston (superseded by Lippincott Raven Press, Philadelphia) 1994. 3. Gotch FA, Sargent JA. A mechanistic analysis of the National Cooperative Dialysis Study (NCDS). Kidney Int 1985; 28:536-534. 4. Held PJ, Port FK, Wolfe RA, STannard DC, Carroll CE, Daugirdas JT, et al. The dose of hemodialysis and patient mortality. Kidney Int 1996; 50:550-556. 5. Owen WF Jr, Lew NL, Liu Y, Lowrie EG, Lazarus JM. The urea reduction ratio and serum albumin concentration as predictors of mortality in patients undergoing hemodialysis. N Engl J Med 1993; 329:1001-1006. 6. Helgerson SD, McClellan WM, Frederic PR, Beaver SK, Frankenfield DL, McMullan M. Improvement in adequacy of delivered dialysis for adult in-center hemodialysis patients in the United States, 1993 to 1995. Am J Kidney Dis 1997; 29:851-861. 7. Charra B, Calemard E, Ruffet M, Chazot C, Terrat JC, Vanel T, Laurent G. Survival as an index of adequacy of dialysis. Kidney Int 1992; 41:1286-1291. 8. Eknoyan G et al. Single-pool Kt/V values for the standard and high goal groups in the NIH HEMO study. J Am Soc Nephrol (abstract) September, 1997.